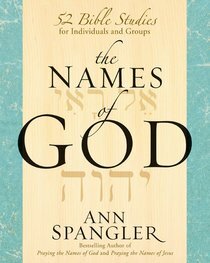 ^ ^Based on Praying the Names of God and Praying the Names of Jesus but containing additional questions for reflection and study, this unique Bible study is designed to help individuals and groups explore the most important of God's names and titles as they are revealed in the Bible. Also included is a helpful pronunciation guide to the Names of God in Ancient Hebrew and Koine Greek. - Publisher What's in a name?The Names of God: 52 Bible Studies for Individuals and Groups offers a unique approach to Bible study by presenting a 52-week study focusing on the names and titles of God and of Jesus, one designed to help readers experience the Lord in fresh and deeper ways. . By studying such rich and varied names as Adonay, El Shadday, Abba, Yeshua, Lamb of God, and Prince of Peace, readers will encounter a God who is utterly holy, powerful, surprising, merciful, and loving.Each week's study includes:? Background information to help readers understand the name? A key Scripture passage in which the name was first or most significantly revealed ? A series of questions for individual or group study? A list of Bible passages for further reflectionBased on Praying the Names of God and Praying the Names of Jesus but containing additional questions for reflection and study, this unique Bible study is designed to help individuals and groups explore the most important of God's names and titles as they are revealed in the Bible. Also included is a helpful pronunciation guide to the Names of God in Ancient Hebrew and Koine Greek. About "The Names of God"
What's in a name?The Names of God: 52 Bible Studies for Individuals and Groups offers a unique approach to Bible study by presenting a 52-week study focusing on the names and titles of God and of Jesus, one designed to help readers experience the Lord in fresh and deeper ways. . By studying such rich and varied names as Adonay, El Shadday, Abba, Yeshua, Lamb of God, and Prince of Peace, readers will encounter a God who is utterly holy, powerful, surprising, merciful, and loving.Each week's study includes:? Background information to help readers understand the name? A key Scripture passage in which the name was first or most significantly revealed ? A series of questions for individual or group study? A list of Bible passages for further reflectionBased on Praying the Names of God and Praying the Names of Jesus but containing additional questions for reflection and study, this unique Bible study is designed to help individuals and groups explore the most important of God's names and titles as they are revealed in the Bible. Also included is a helpful pronunciation guide to the Names of God in Ancient Hebrew and Koine Greek.